Year: 2013. Client: AlFawzan & AlRawdan families, Kuwait. This logo design was developed by Tarek Atrissi Design based on a commission by two families in Kuwait. The logo was designed specifically for a wedding event and combined in Arabic the names of the two families, Al-Fawzan and Al-Rawdan. 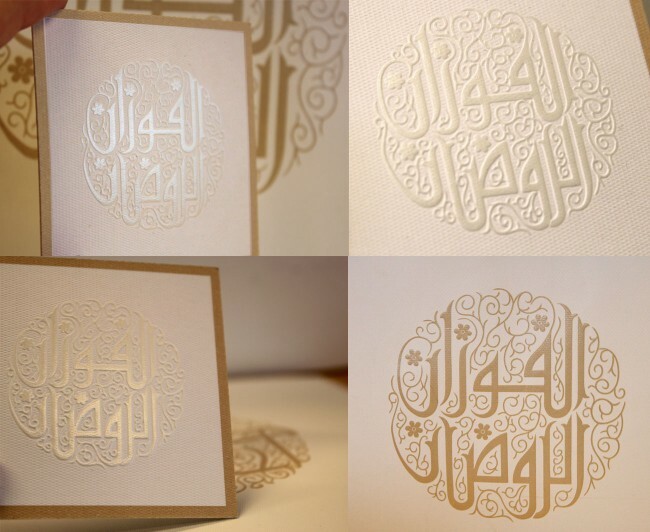 The design consisted of an ornamental Arabic calligraphic circular design, mixing Kufi style with graphic ornaments to provide an elegant icon to be used as the symbol of the wedding. The logo was used as a primary element on the wedding card invitation, giveaway and gift bags and RSVP cards. Printing techniques used included embossing, using metallic pantones and UV printing; giving the overall set of printed material for the event a luxury finish characterized by elegant simplicity.